The Q-OSSEC® (Open Source HIDS [Host Intrusion Detection System] SECurity) network appliance is a stand-alone monitor of all ‘Nix system activity, including file system monitoring, log monitoring, rootkit checking, and process monitoring. The Q-OSSEC network appliance also provides comprehensive host-based intrusion detection across Windows, Linux, Solaris, AIX, HP-UX, MAC, and VMWare ESX. The Q-OSSEC network appliance is intended to complement the other Quantalytics network security appliances to help provide greater in-depth network defense. However, the Q-OSSEC network appliance may be used on a stand-alone basis. It is ideal for PoS (Point of Sale) networks. The Q-OSSEC network appliance can inspect PoS networks for PCI DSS 1.2/2.0 compliance, as well as monitor for unauthorized file system modifications and alert administrators if any occur. The Q-OSSEC network appliance also provides log file analysis of COTS (Commercial Off-The-Shelf) products. OSSEC (Open Source Security) is an open source, host-based, intrusion detection system (IDS) which performs log analysis, file integrity checking, rootkit detection, and policy monitoring, and then provides real-time alerts. OSSEC also includes active response features for use after an alert through its Security Information and Event Management (SIE/SIM) components. Alerting is done through email and syslog. Logs can be exported to the Q-Log® or any other syslog or SIEM system. OSSEC provides intrusion detection for systems running Windows, Mac, Linux, Solaris, AIX, HP-UX, BSD, and VMware ESX. OSSEC also allows network administrators to check for, and certify, PCI DSS 1.2/2.0 compliance, which is essential for securing Point-of-Sales (PoS) networks that accept credit cards. Xplicio is a leading open source package for real time network packet capture and forensic analysis. In the event OSSEC shows suspicious activity, network administrators can capture and examine in depth real-time traffic for deeper analysis of suspicious network traffic. In addition to packet inspection, Xplicio allows for reconstruction of the actual traffic. E.G. E-mails, texts, IM’s, pictures, etc. The Q-OSSEC has both 1000 mbps (gigabit) NIC and 802.11 b/g/n WiFi. The Q-OSSEC network appliance is also available as a Virtual Machine (VM). The Q-OSSEC is completely administered through a Web GUI. All package usage is via Web interfaces, thereby opening up sophisticated intrusion detection, network forensic analysis, and network monitoring to even novice network administrators. No Command Line Interface (CLI) or Linux skill is required. Notifications are provided by e-mail using SendMail, which is configured with a module in Webmin, and syslog entries. 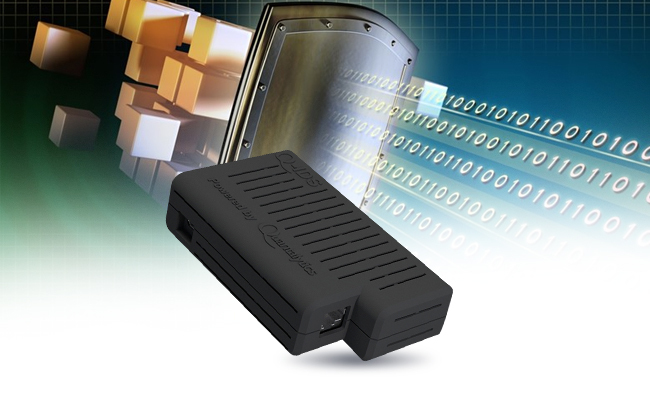 The Q-OSSEC network appliance can be integrated with Nagios® on the Q-Box® as another notification route. SMS notification is available as an option. The Q-OSSEC network appliance can also be integrated with the Q-Log® network appliance or any other syslog or SIEM solution. Q-OSSEC® and all registered trademarks above are property of their respective owner(s).